This pure bright gem from Mabian county is the rarer version of the world-famous Huangshan Maofeng tea from Anhui. Grown at the altitude of 1450 meters, with unique terroir, surrounded by misty air and cool climate, this Sichuan gem offers mild taste, but long and sweet aftertaste. With very clean and floral aroma Misty Emerald is able to transfer you right in the middle of blooming flower fields in a cool spring dawn. Enchanting transparent bright green color of Misty Emerald hides a unique character and freshness. Contains as half of caffeine as black tea. Don't drink green tea for six hours before bedtime. 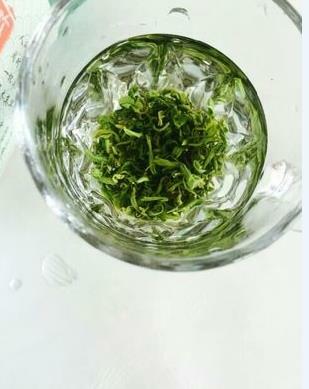 3 grams of loose leaf tea in 300ml of 85℃ water for 1.5 minutes. Re-steep 2-3 times. Video: How to brew a cup of green tea? Among all types of Chinese tea, green tea stands out not only due to its long history and unique flavor, but because of the numerous benefits it can offer. leaves are still going strong! Brewed this properly today, short steep time (10 seconds for first instead of a minute, adding about 5 seconds each infusion) and i love it! Have had 2 cups, the boyfriend had 2, and the leaves are still going strong! I really enjoyed this tea� could not recommend it more! This green reminds me a bit of Japanese green tea yet has all of the character of a great Chinese green. Sweet melon taste and a complexity that is beautiful. I was expecting a bit more considering its price, to be absolutely honest. I��ll try making it a bit stronger next time around, this is a very light leaf after all. I did have to play with the temperature and timing a bit to get it just right. Remember not to steep it for more then one and a half minutes, otherwise it will taste like lima beans. The best green tea I��ve ever tried. Rich and satisfying, but, being a green tea, it��s also light and refreshing.